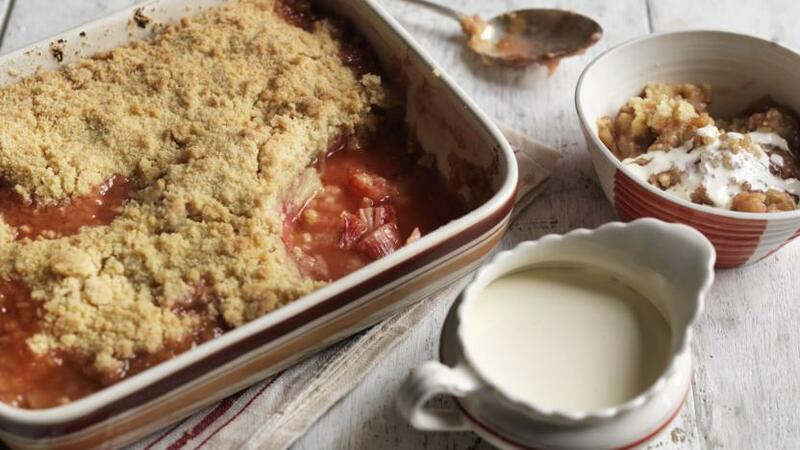 Put on your Sunday best for the comforting taste of rhubarb crumble and Guernsey cream. Place all the ingredients for the crumble mixture in a large bowl. Rub the butter into the flour, sugar and salt, lifting and dropping the mixture lightly through your fingers. Pile the rhubarb into a buttered earthenware dish. Sprinkle over with the sugar, pour over the lemon juice and distribute the flakes of butter over the fruit. Cover the fruit with the crumble mixture, sprinkle over a little extra golden caster sugar. Place into the oven and bake for 35-40 minutes, or until golden on top and the jammy juices are oozing up around the edges of the dish. Serve with lovely and thick Guernsey cream.